Recommendations for boar hunt ? 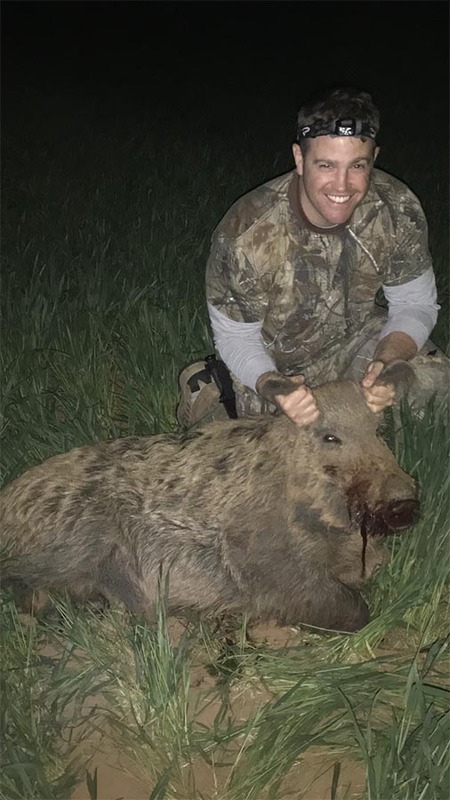 Thread: Recommendations for boar hunt ? Don't know what you mean. It is about 1400 acres. Last edited by adalah; 03-29-2019 at 02:23 PM. My buddy Vinnie and I left Fairfield, NJ at 6:00am on Monday 30 March and headed out to 80, to 287, to 78, to 81 and finally to 40; arriving at Loshbough at around 5 m Central Time. My Ford Escape was fully packed and we brought two coolers each for the meat. The guns were locked up in a Thule ‘roof coffin’ I borrowed from my sister in law. We reserved the bunkhouse which is separate from the main lodge and comfortably sleeps 4 with a full kitchen, bath and living room. We unloaded my Escape and got all the equipment and food packed away. We gathered up what we would need for the hunt the next morning, inventoried our packs and unpacked the guns. I brought my trusty .lever action 44 Magnum Marlin 1894 Octagon and a 1911 Colt US Govt. .45 as a sidearm. Vinnie had a bolt action Winchester 223 Magnum and a Smith & Wesson 469 auto in 9mm. With that all done it was time to relax a bit. We sat outside and fired up some Partagas #8 Maduro cigars. Vinnie brought a bottle of Tito’s Vodka which he likes on the rocks and I brought a bottle of Colonel E. H. Taylor bottled in bond Bourbon and a backup of 10yr old Russell’s Reserve that I like with just one or two ice cubes. I cut up some Elk salami that my buddy Dennis out in Wyoming sent me and we just relaxed from the long ride. A few minutes later our guide, Chris, stopped by, introduced himself, and we discussed how we would hunt over the next two days. Chris is a large guy with a thick Tennessee accent and a great personality. We talked, joked and told hunting stories for about an hour. We decided to do some stalking in the morning and then sit on a baited blind mid afternoon through evening. If need be, we would go out with the dogs on Wednesday. Once Chris left we were just too tired to make any dinner and, after a few drinks, we hit the rack. After a good nights sleep, we rose about 6:30am and got ready for breakfast. Coffee was on and I brought some Pecan smoked bacon that I made with some eggs and an Italian Pannele made with semolina flour toasted with butter. A glass of OJ finished things off and we were ready to go. The morning was clear and around 40 degrees so I just had on jeans, a long john top and an MA1 flight jacket. Loshbough supplied all the condiments and coffee, utensils, paper goods, plates, pots and pans, etc, so all we had to bring was the food. Chris showed up at 8:00am sharp and we loaded everything into an extended cab pickup that has seen better days. However, you would not want to take anything better than this to where we were going. We left the lodge and drove out to the main road. After about half a mile, Chris turned into the woods on a very narrow dirt road that had ruts as large as the Grand Canyon. Proceeding at a crawl, we bounced our way to a gate. Passing through, the road was not much better and we finally came to a halt next to a muddy and bloody Kawasaki Mule. Exiting the truck, we just took our guns and, following Chris, we headed down the road. The area where we were walking was made up primarily of white oak trees which provided lots of acorns for the hogs and other game. The undergrowth was made up of Holly, wild Rose and some Ginsing. Yes that infamous Ginsing you see on TV whose root is worth about 500.00 a pound. Chris told me there is actually a season on the picking of the plant. As you can see in the pictures, there is not a lot of foliage on the trees yet so visibility is quite good. The terrain is made up of hills and hollows and we left the dirt road heading for higher ground. Now I’m 69 and my buddy Vinnie is 75 so after a short time it was slow going but we managed to make it and stay alive for a couple of hours of trekking. We saw plenty of sign: prints, rooting, rubbing and bedding down areas but did not see any hogs. Chris wound us around so we worked our way to the area where the blind is located. He had us wait there while he went for the mule. After a short while, Chris arrived and suggested we head out to the lake area where he said he’s had good luck. It was about a 20 minute ride to the lake area on dirt roads that, at times, had us at a 45 degree angle. I felt like I was in a sidecar; shifting my body weight from left to right so we don’t tip over. The road around the lake was a bit smoother and we proceeded at a slow and quiet pace. We started to walk around the lake looking for some hogs; you could see where they recently wallowed on the bank. About ¾’s of the way around the lake, Chris spotted a lone hog foraging in the brush about 75 yards away. Being that I got a hog last year I told Vinnie to go for it. I was certain that I would get one anyway and this was his first time. Vinnie stalked up quietly to about 50 yards and popped one into the shoulder and the hog went down. He ran up close to it for the kill shot and put another round into its vitals. This feral hog weighted about 300 and it took all three of us to get it up on the mule. After getting it into the back of the pickup, we headed back to our bunkhouse for lunch. Vinnie filled out the processor’s form indicating how he would like the hog cut up and Chris took it into town. I buy all our meats at The Corner Butcher Block in Caldwell, NJ and I picked up some fresh burgers, pecan smoked bacon and Italian sausage for the trip. All the steak is prime grade. When you go in and ask for burgers, they ask “what size and how many” then they say “I’ll be right back” and they go in the back and make them. Good stuff indeed. Just outside the main lodge there is a BBQ area with grills, smokers and picnic tables. I brought a few bags of Jack Daniels charcoal with barrel pieces and lit up the grill with one. I threw on two ½ lb. burgers and heated up some fried peppers and onions I made a few days ago. Toasted up a couple of nice rolls and it was heaven on earth. We had about an hour to kill so I just lay down in my rack and took a snooze. We also met two couples from West Virginia who arrived late morning. They told us they’ve been coming there since 2004 and one of the wives, Dolly, showed me a picture of a 600 pound boar she shot with a .50 cal muzzle loader the previous year. Chris picked us up around 2pm and we headed back out to the bait/blind area. Weather was now in the 60’s and clear. We were dropped off at the blind which Chris baited with about 10 bags of corn and told we would be picked up after dark unless we called that we got a hog. We had our packs with gloves, wool caps, some energy bars and a camera. Anyway, Vinnie and I settled in for the duration and watched the doves and squirrels hit on the corn and the woodpeckers dart from three to tree. No hogs in sight but I had high hopes based on last years experience. Temperature remained comfortable and before you knew it the sun was starting to set but still no hogs. It was now after 7:30pm and no hogs. About fifteen minutes later I could see Chris coming down the dirt road with the lights off just in case. We headed back to the lodge and looked forward to the next day with the dogs. Back at the lodge we sat around with the West Virginia hunters and consumed some adult beverages, Elk salami and other snacks for about an hour and turned in. The next morning we had our same breakfast and Chris picked us up at 8am with a couple of hounds in a cage in the back of the pickup. We decided to go back to the lake area and try our luck. We parked by the lake and let the dogs out. They started running around in all directions but then took off up the road away from the lake. You could see plenty of tracks in the muddy road. Meanwhile, we walked down the road in the opposite direction. Not 30 yards down the road Chris spots a hog just browsing in the brush. As we moved closer, the hogs head perked up and it was looking toward our direction. I eased up slowly but could only see the head as the trees blocked the rest and I couldn’t risk it taking off. I placed my sights in the neck area and let one go at about 60 yards. The hog spun and stopped as if it was stunned. It then started moving to my left toward the lake and I put another into the shoulder area. That put the hog down but it was still kicking. I got up close and finished it off. This hog was at least 50 lbs heavier than Vinnie’s and we could barely get it up on a Quad and back to the pickup. In the GoPro video you may hear an extra round fired which was an accidental discharge as I was moving toward the hog. The video does not show the first shot; only #2 and the kill shot #4. Well, we are back at the lodge before 9:30am. Chris took my kill into town for processing and we sat around cleaning the guns and straightening up. We showered, shaved and went into Crossville to Lefty’s BBQ for some great eats. We chowed down on ½ racks of St. Louis ribs that you didn’t need teeth to eat and a side of baked beans. The ribs were sooooo good and needed very little sauce if any; just the rub was great. The rest of the afternoon we just relaxed and chatted with the West Virginia hunters who were going out the next morning with just pistols and dogs. The processor showed up around 3pm and we loaded our hogs, all portioned out and vacuum packed, into the deep freezer in our bunkhouse. We had ribs, chops, roasts, whole ham and lots of sausage. Around 5pm I lit up some more JD charcoal and put the sausage on a little after 6pm and heated up the peppers and onions. Chris showed up with a quart of local Shine and a quart of local Apple Pie shine for me to take home. We sat around the rest of the evening smoking cigars, drinking whiskey and having great conversation. Unlike last year, the weather was really seasonal; 60’s to 70 every day with clear sky. The next morning we hit the road around 8am and drove straight through back to Fairfield. It was a great trip, again, and I look forward to firing up the smoker. njpddet and Boykin Runner like this. Was awesome, 3 of us killed six pigs and one coyote. Could have definitely taken more but we had more than enough to fill our freezers. Flying was easy enough and you can buy dry ice right in town. Check out roblynsneck.com, been there with my son. Plenty of wild hogs. Clean accommodations, good food. South West Florida boar hunt - Any recommendations? ?